I usually tan quite easily if the sun shows up and if I manage to get out in it (these two things happening simultaneously is a rare enough occurrence) but I am generally a little on the pasty side. Not English Rose or Porcelain Beauty, all pale and interesting, just slightly-verging-on-ill-looking pale. And when I'm cold, my skin does this awesome trick of going even paler. Not beautifully radiantly ethereally translucent, more mottled with blue splodges. Very attractive. The Golden Girl Tan declares that it provides "Subtle sun kissed colour with intense hydration for face and body"', and I can confirm that it is just that; not an obvious mahogany slick o' varnish, but a really gentle, barely there, healthy haze of colour. Also, and nicely, not really dark enough so that people notice that you've been meddling around with the fake tan bottle, but just enough so they think you look healthy and radiant. It takes the edge off so to speak. And I also observed that I had a much sunnier disposition while wearing it, a tan just makes us feel warmer and happier and healthier, even on the dullest of days. I've kind of done this review backwards but I was so delighted with the results that I hit you with those first. So let's go back and start at the beginning. The packaging is a squeezey 150ml tube with a flip top lid, good for hygiene and convenience. The purple tube bearing a gold logo has both a regal and bohemian feel to it which I like a lot as it appeals to both my queenie and hippie sides :-). On opening the lid I was hit with the utterly divine zesty citrus sherbet-type scent (I'll admit that sometimes I just like to open it to get a quick whiff). It smells of joy! Unfortunately the delicious smell fades within the hour and you are left with a fake tan odour (which always reminds me of musty clothes- yuck) however it's not quite as offensive as other brands. The texture is a satiny soft cream, which looks thick when squirted out but applies so effortlessly, it just glides. No pulling-it-around-the-skin required. 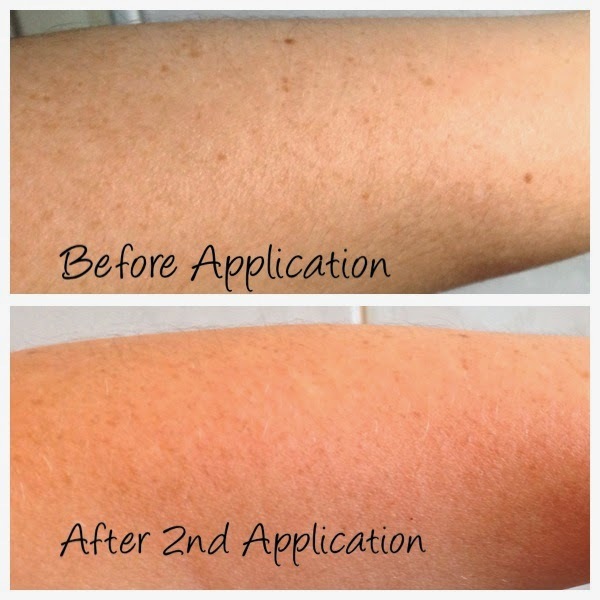 It absorbed as quickly as a standard body cream and I didn't feel the need to pull out my standard Self-Tan John Wayne moves at all - I was dressed and ready to go ten minutes after application (for tips on skin preparation and the best way to apply look here). I've always had fake tan streaking issues (of the stripey variety as opposed to the naked kind) with previous tanning products that I've used. And smudges at all the knobbledy areas. And white shins because tan has always, without fail, refused to just "stick" there. It has been quite some time since I've even bothered because I'd more or less accepted that I was just shite at applying it. So I awaited the outcome of the Karora tan and was pleasantly surprised when about four or five hours later I was tanned! All over! The same colour! Ok, I had slightly darker smudgy bits between my toes where I had been a bit sloppy, but a quick wipe with a wet cloth and all was well. I slathered it on three days in a row, each application after a shower. The colour doesn't get particularly darker than the first application but as I mentioned before, that suits me perfectly. The sheer brilliance of this product purely from a moisturising point of view also needs to be celebrated. As it's packed with nourishing superstars such as Argan Oil, Coconut Oil and Jojoba Seed Oil (and free from parabens and all manner of other nasties), this cream is seriously hydrating and feels like a glorious treat. It absorbs well and doesn't leave a residue. My skin has been super smooth and soft. Even if it didn't work as a tanning agent I would use this as a stand alone moisturiser. Even on my face, there was no breakouts, no adverse reactions of any kind, even when I got it quite close to my eye area, my super sensitive eyes didn't start streaming and puffing up. Big thumbs up from me on that front. Repurchase? Most definitely. For €18 you can shake off that deathly pallor (or hide it at least), get super soft and feel fabulous (and sniff the tube, ahem). Without a shadow of a doubt, it's a bargain to behold. Until next time, glow radiantly!